In 9th grade, I joined an organization called Huntington Youth Court (HYC) that is comprised of high school students from the various high schools in the town of Huntington. It was created by Councilman Mark Cuthbertson in 2000 with the goal of preventing delinquent youth behavior through positive peer influence. HYC is a program run by youth for youth. 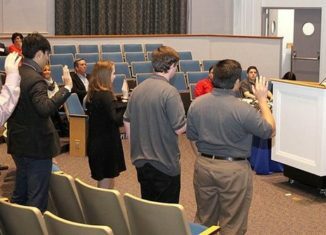 In the town of Huntington, high school students who commit misdemeanor crimes are given the opportunity to have their cases heard by a jury of their peers. Through peer influence and community involvement, this program strives to achieve a positive educational experience for both the offender and the HYC members who conduct the trial. Not only do HYC members gain a vast insight into the legal and court system, but the offenders also learn through their community service experiences they are required to perform. As typically seen in court cases, HYC members perform the various roles including prosecuting and defending attorney, judge, bailiff, and jury. Each Youth Court member commits to a ten week training program that encompasses a variety of topics. The program details the operation of youth court, the penal law, and sentencing issues. After successful completion of the youth court bar exam, the members brush up on their skills through mock trials. All of this preparation leads up to the HYC member participation in the actual youth court proceedings. For the actual case, youth offenders are asked to appear in front of the youth court with a parent. The jury may impose a sentence from a range of options specifically tailored to the youth offender. For example, the requirement may be a combination of community service hours, an apology, and counseling sessions. In HYC, members are taught the importance of restorative justice in which the offenders are held accountable for their actions in addition to customizing the community service requirement to the offender’s interests. For one case in which I was on the jury, the offender showed an interest in painting and drawing. We organized his community service requirement around painting areas in the town that needed improvement. On September 27th, 2016, the future of HYC came into question. At Huntington Town Hall, a meeting was arranged to discuss the funding for the upcoming year. The key issue was whether or not to increase the tax cap so that youth services could continue. HYC board came to “save youth services.” The town hall was divided: yellow shirts supporting the tax cap and blue and black shirts opposing the higher taxes. My fellow HYC board member, Keylin, represented our youth service program by giving a brief speech at the meeting. Keylin, a Harborfields High School student stated, “I want to thank Youth Court and Youth Services for helping me become a better person and leader. I have seen kids struggle and fail and then pick themselves up and become active in the community. This is what our community is all about. Open your hearts and save youth services.” Her compelling speech helped pave the way to override the state tax levy limit and pierce the cap. It was very exciting to see that the youth services would stay intact to help our community flourish in fostering youth programs such as HYC. Being an active leader in HYC, I have grown immeasurably. I have ascertained skills necessary to cross-examine witnesses, construct and deliver opening and closing statements, become an effective public speaker, and think quickly on my feet. It has instilled in me a connection to and sense of pride in serving my community. Since its inception, the Youth Court has inducted over 580 students to its membership and has heard more than 370 cases. Under the direction of Project Director, Maria Danisi, Huntington Youth Court is funded by the Town of Huntington with the support of the New York Bar Foundation. If you are interested in learning more about this program in which you can serve your community, contact 631-271-5547.